Hi, I’m Marta and I’m addicted to libraries. 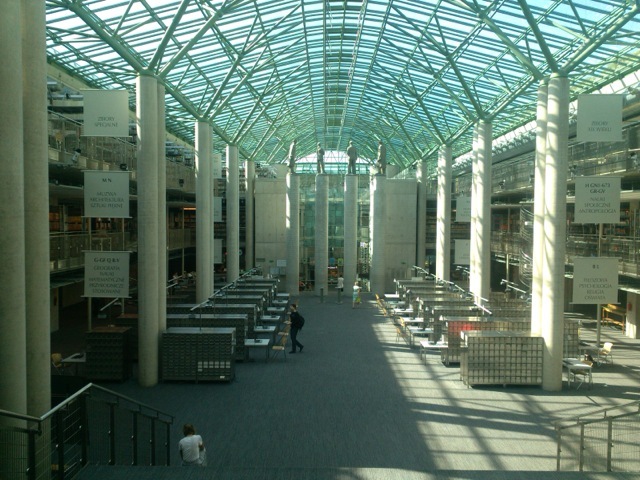 I’m a person who actually celebrated her 16th birthday by getting a pass to my local Warsaw Uni Library (BUW). So by now I’ve probably squandered the best years of my life between bookshelves. But still there were things that surprised me about Warwick Uni Library. My library in Warsaw: you pass the entrance pillars, the carpet muffles the sound of your steps and momentarily you’re surrounded by silence. People lower their voices to a whisper and tiptoe (as if the carpet wasn’t enough, right?) It’s a custom in Poland to keep down in libraries and most people oblige to the rule spontaneously. If you’re not one of them, there are signs here and there (a succinct Latin SILENTIUM) to remind you just where you are. If you do make any noise (say, dropping a book, or a pencil, for that matter), you will get lots of reproachful looks from fellow library-goers (including myself-guilty!) and usually from at least one owl-eyed librarian. My library at Warwick uni: you pass the entrance gates and you are momentarily surrounded by hubbub. 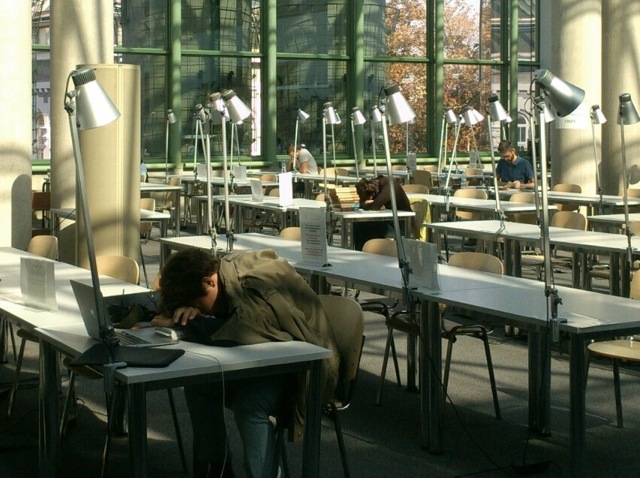 There are however sections dedicated to quiet study. So I’ve heard. You can enter with food! This came to me as a real shock. 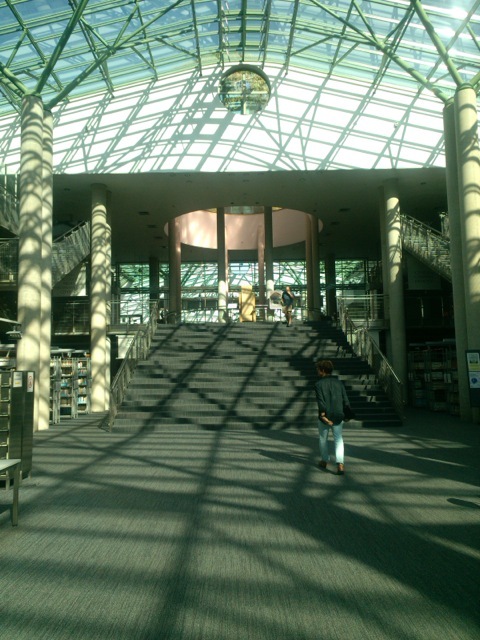 I still get goose bumps when I recall the gaze of a librarian who caught me eating an apple on the stairs of my Warsaw library (technically nowhere close to any book!). At Warwick they would probably let you in with a pizza box. There are good and bad sides to this. The good is obviously the comfort of reading your book with a coffee in hand. The bad is not having an excuse to take a coffee break. Did I just write VIP room? Sorry, I meant PhD-room. Also known as the Wolfson Research Exchange. At first I thought it was just so classist to have a section of the library where only research students can enter. And to furnish it with these ridiculously comfortable sofas! Then I started using the Wolfson Exchange, and stopped caring. I think that is, in a nutshell, how class privilege works. In Warsaw, there is another sort of privilege. You are allowed to skip the queue for book rental if you’ve got a scientific title. Sorry, a mare PhD doesn’t count. They only care if you are a professor or a habilitated doctor. What is a habilitated doctor? It’s someone who can skip the queue in Warsaw Uni Library. And when they do… they will have to face the librarian. The look (s)he gives you, while informing when the book is due – you momentarily know that even one minute’s delay will put you in a lot of trouble. In Warwick Library you can check out your book in a machine without interacting with librarians (and that is probably why I already had to pay several £-worth of overdue books). The ones I approached (I mean librarians, not books) were very competent and helpful, while not giving the ‘hush-and-appreciate-the-splendour-of-knowledge’ vibe I was so used to. Overall, I’m very happy with my new library: I appreciate the long opening hours (even if it seems completely deserted after 8pm), the wide range of newspapers (even if I always browse the same one), and the lively atmosphere (even if I often secretly wish a librarian-owl will fly in with a gloomy husshhhhh!). There is however one thing Warwick Uni Library could definitely copy from my dear old Warsaw one – opening a crèche for students who have children. It would certainly make the library a more egalitarian space, and it really couldn’t raise the noise levels that much! Text and photos: Marta Natalia Wróblewska (@martawrob). The author is currently in her second year of PhD studies at the Centre for Applied Linguistics. Her research focuses on the discursive construction of the notion of ‘research impact’ in academia.